Well the Gypsy in me is on the road again. After a few months of snowy wonderful Colorado and working on a project while having the luxury of being around the corner from my oldest daughter, I was about to put a few roots down and after nearly five years rent an apartment. Then the phone rang. As I have learned in this delicate art of navigating signs and serendipity I have finally, after all these years, become in tune with when I am moving in the wrong direction, when to stand still and when to simply say yes to the unexpected. This was one of those phone calls. “ What about beauty, adventure, healthy eating, learning Spanish, finishing your novel, getting a tan and slowing down, slowing way down Maya?”. I called Julianne and said yes. Then it all fell right into place as it always does, with the help of my LA daughter being willing to take my car and my beloved cat Hazel. 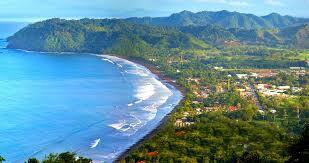 I arrived here in Ojochal (pronounced OhoCHal) on the pacific side of Costa Rica four days ago. That is a story I will tell next blog post. I am here now, living in such Eden like beauty, surrounded by the rainforest with the ocean visible from my room, eating coconuts and papayas 24/7 and realizing that American life is frenetic and hazardous to my health more than I thought. So now after only four days, I will be sharing my adventures, my Aha’s, my challenges and my travels with you. I will post each week and share some stories, some insights, some recipes, photos and tips about being an Ex-Pat here in Costa Rica. I wake to Parrots in large flocks soaring overhead and louder than any LA traffic but music to my ears. Parakeets are in all the trees that surround our home here, but what is most astonishing is that the minute I stepped off the little six seat plane in Quepos, felt the 100% humidity, the perspiration running down my back, all I could do was smile. The regular afternoon thunderstorm is now revving up so I will unplug my computer and go and watch the show. I am giddy with excitement for you and for us following this great adventure. How magical, dear friend. I love you. Sounds so wonderful, Maya! And kudos to you for stepping out for that next adventure when society tells us to relax, stay put, no risks! Good for you and I can’t wait to hear about your daily adventures and the scenery I know you’ll be exposed to! Truly magical! Oh me too Maya!!!!! I am so happy for you….. It will be a dream come true for me through you!!!!!!! I cannot wait to hear about our journey!!!!!!!! What an extraordinary woman you are!!!!!!!!!! I adore you!!!!!!!! !